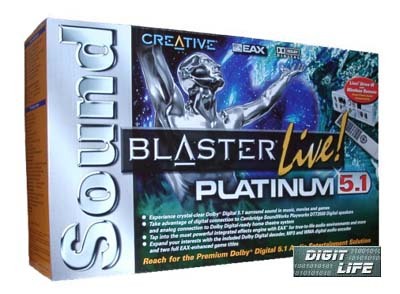 Today we will consider in details a sound card Creative SoundBlaster Live! Platinum 5.1. Despite the fact that a sound chip on all cards of the SoundBlaster Live! model series is the same - EMU10K, the new card from Creative with a prefix 5.1 is already their third generation originating from 1998. This card, Live! Platinum 5.1, is the most perfect creation of Creative today. In the first turn your eyes catch magic signs 5.1. On the other hand, there is a tempting remote-control hiding on the right side of the picture. In other respects, the design is fully correspond to the previous card of Creative from the same series, - the SBLive! Platinum. If you haven't guessed what 5.1 means, I'll explain. It's the last word in fashion in sound card market - to provide their products with 6 analog linear outputs for reproduction of sound accompaniment decoded for 6 channels in games, DVD-movies and even for reproduction of multichannel musical compositions (files with AC3 extension). The IR in the module's name stands for infra red, meaning a support of an infrared remote-control. Indeed, the card is not cheap, and such option as a remote-control looks not as an excess but as a logical extension of its possibilities. Having bought such a rich set you can immediately start any activity - from entertainment to sound processing on a small home studio. Everything is housed in a good wide InWin case of the midi-tower format with 235W power supply unit. Before installation of the Platinum you better read the manual since you may confuse two cables, similar to the IDE. They are intended for different functions. Reading of the manual before installation matters much since in the installation menu you will find many programs and utilities without any comments on their destination. This time a convenient version Adobe Acrobat 4.05 for viewing pdf files (the main improvement of which is a support for scrolling) goes right on a CD with drivers. I tried to install two Live! 's simultaneously in the system: Live!Value(4830) and Live!Platinum 5.1. Like in the beginning of 2000, when the Live!Ware3 just appeared, two Creative cards (at that time the second of them was a "usual" Platinum) do not operate with the native drivers in the Win98. One works good, and the second refuses operating, though we haven't noticed any conflicts with resources. After long exhausting experiments with installation we couldn't get the both cards working. Once, though, new drivers, suiting the Live!Platinum 5.1, worked with a usual Live! Hope that Creative will soon write good drivers matching the whole series of their cards. The Creative Launcher that is appearing over the desktop has undergone some changes. In fact, the Launcher contains nearly three times more server utilities, the main of which is a mixer. Unfortunately, the Surround Mixer looks the same. And despite the files with *.skn extension we can't change a black-yellow decoration of the skins. Even a familiarization examination would take us to far from the card itself. Let's try to make definite conclusions from the complete set of the Live!Platinum 5.1. In the review on the Platinum last autumn I pointed to the fact that PC multimedia companies were entering the industry of entertainment - a place that were originally taken by manufacturers of consumer electronics and playstations. Now it's clear why Creative virtualized the menu in the form of a typical interior of a relatively small two-storied apartments for starting of demo programs. Such interiors are created with the help of a soft of the company PixAround.com (".com" lays stress on its virtuality). Such implementation of the menu is imho more interesting than a standard one. The set also includes demo-versions of the programs allowing to create such photopanoramas of your own photos with a virtual pasting together in a ring. But the most interesting feature turned to be a presence of 6 audio-demo in AC3 format. The files have the same extension (*.ac3). 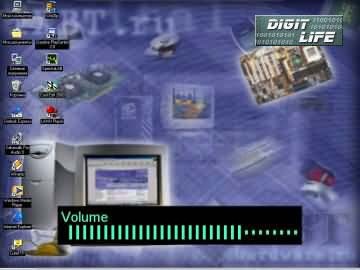 The files are coded according to the scheme: 96X2+64X4 (in the article VideoLogic DigiTheatre and DigiTheatre DTS you can read in depth on sound coding in Dolby Digital 5.1 standard). What's the "weight" of such compositions we can estimate according to their bitrate. 3-4 [min] * 60 [s/min] * 448 [kbps] : 8 [b/bit] : 1024 [MBytes/KBytes] ~ 10-13 MBytes is in average for each standard composition. Well, the Internet in every home is not far off. Besides, the fashion for 128 kbps mp3 is going away little by little. On the other hand, today, I wouldn't reject 60-70 compositions on a CD-R in AC-3 format :). The LAVA technology has grown a bit for the last year and improved its quality. A cool color music has poured into quality virtualization with usage of the latest achievements in the sphere of Direct3D-effects. All writings are made in clear legible print (scalable for all resolutions) on a contrast black background. It's rather comfortable to use the general volume control. Especially if the sound is output on an amplifier that has no remote-control. Below you can see a comparison of characteristics for the boards SBLive!Platinum 5.1 with a 4-channel codec SigmaTel STAC9708 and SBLive!Platinum (with SigmaTel STAC9721). As usual, for quantitative estimation of parameters of sounding quality we used a program SpectraLab 4.32.14. If you want to make measurements once more, I recommend to find the last version of this program at www.soundtechnology.com Below you can find spectrograms of the tests for gain compression and noise with the 1 KHz reference sinusoidal signal on the input. The test sinusoidal signal with -3 dB amplitude was obtained in the wav-editor SoundForge 4.5 with a standard generator Simple Synthesis. Such a choice can be explained by the fact that in essence nobody normalizes volume to 0 dB, and secondly, for adequacy of result comparison, since at -2 dB on many cards distortions grow much. The first series of tests was carries out on an internal card's path: "audio controller->AC-link->DAC co the codec->ADC of the codec->AC-link->audi controller". The results can be applied for example when converting MIDI-tracks into Audio-tracks in a sequencer. All other sources, equalizers and tone control were disabled. In order to eliminate errors we carried out the test several times and chose the best results for each card. The second series of testing was carried out by giving a signal from linear outputs of the card into its linear inputs with a cable "minijack-minijack" soldered from shielded mic wires (d=6 mm, 10 cm long), golden connector of Taiwan production. Out of the cables we made a twisted-pair cable. These tests would interest those who are going to implement sampling of an audiosignal from a linear input (e.g. to write musical compositions from a tuner and than compress them into mp3). Line2 input is a linear input on the panel Live!Drive IR. I disassembled the module to study what was inside. As an ADC for this input there used a chip Philips UDA1360T with quite good characteristics (SNR = -97 dB A @ U=0, THD+N=-80..85 dB A @ 0 dB). And as to the path for headphones with a volume control (together with DAC UDA1451TS), I didn't like it much. The second harmonic is huge, besides it will be too noisy as compared with the Rear Out (the control was implemented with headphones Philips HP600 for Digital, 106 dB sensitivity). So, the conclusion. The measured characteristics allow claiming that the Platinum 5.1 is at least not worse than its predecessor, a usual Platinum. And in the tests Codec's loopback (especially in 44.1 KHz), the 5.1 pulled itself up considerably. That is, it makes no sense to buy an old Platinum today. Let's look at the AFC of the card. The file with fluently changing frequency from 20 Hz to 20 KHz was generated in the CoolEdit 2000. Waves appeared in the beginning of the frequency scale is because of our methodical inaccuracy. They appear because of life-finitness of the test WAV-file. The Platinum 5.1 have pleased us with the even AFC of its inputs and outputs. And a little unevenness (+1,-1 dB) of the second linear input won't confuse even a strict music lover. What's good in these tests? First of all, their simplicity and reiteration. Attention! The data shown are not absolute. They serve only for comparison of one card with the other. A manufacturer can give you figures which are received in completely different test conditions. The parameters of applied elements can differ as well what brings in a dispersion in the final characteristics of each definite product. The hottest topic in the conferences dedicated to sound cards is: "It can't be that this Live!5.1 with its old chip EMU10K, 1998, could decode anything hardwarily..."
Let's examine this together. The main cause of such vitality of the Live! concludes in the fact that the EMU10K chip was developed as a universal engineering product for far not child sound cards and samplers of the company EMU. That's why it possesses many resources for expandability. The chip has outputs for working with AC-link bus and with I2S bus. Besides, it is equipped with 4 S/PDIF out. Scheme of pins of main outputs. In a usual Live! there is only one output, the information on others doubles. In the 5.1 card series they use already 3 such outputs. My friends has installed a firmware upgrade on the Live!Value1024 (CT4830) from a similar one of the Player 5.1. The drivers worked without difficulty, all applications worked as if it were the 5.1 card. So, all rumors on special and optimized for DolbyDigital revision of the EMU10K chip were disproved in practice. The DolbyDigital 5.1 decoding is implemented on the driver level. For this you need a soft DVD player (with support for the AC-3 stream on a digital output of the Live!). And when setting the option "AC-3 decode" in the Surround Mixer, and choosing S/PDIF output mode (or something alike) in a soft DVD player, we get decoding of the AC-3 stream with the card's drivers. And there, you can't receive a signal from a digital output neither of the Live! 5.1 nor of the Platinum 5.1. 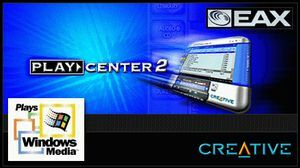 Initially Creative positioned their card for "DolbyDigital ready" receivers or for their sets without hardware decoder (such as the DTT2200). 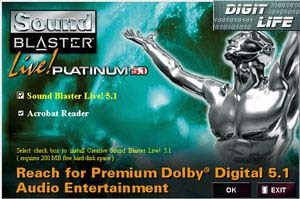 However, the last releases recommend usage of the 5.1 series card also with the DTT3500 (which contains a hardware decoder). On the other hand, nobody prevents including 6-channel card support in the last versions of the WinDVD or PowerDVDC, and give DolbyDigital decoding to internal algorithms of these good programs. But these programs are commercial, and in the 5.1 although this support are realized in the soft, but it's included in the complete set. The receiver Onkyo TX-DS484 has not only the both digital interfaces (coaxial and optical) but also a 5.1 analog input. It means that we had an opportunity to compare the quality of decoding and reproduction of the Live!Platinum 5.1 and the hardware decoder in digital inputs. For tests I used DVD demo trailer rich with sound effects of several Hollywood movies (Blade, Matrix, The Mask of Zorro, Tomorrow Never Dies, etc.) with different bitrates of sound tracks (from 256 to 448 kbps). The sound quality shown by the Live! on analog outputs were rather good. Besides, the mixer provides an opportunity to adjust the volume of the subwoofer separately. And when I switched hardware decoding in Onkyo, the sounding changed. Timbres became more rich and sounding wad more natural. 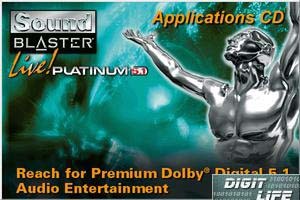 But if I hadn't heard the hardware decoder, I would have been rather satisfactory with Platinum 5.1 quality. After that, I tried to reproduce a sound track with a 6-channel option of soft players. I haven't noticed any marked difference either in sounding quality or in CPU utilization as comparing with the Live! drivers. In the article on a usual Platinum I arranged a competition in MIDI for three main contestants at that time on the sound card market - Live!, Yamaha and Vortex. The last year has changed little. That's why if you are interested in usage of the sound card as a phonogram in a karaoke player, for old games with MIDI sound, for learning musical reading and writing or for making your own musical experiments I' recommend to look at the test results and listen to sounding of the mentioned sound cards in my previous review. There, I also described all advantages for musicians with usage of being prepared new 2.0 drivers for Live! and EMU APS. But a year passed - and nothing changed... As to usage of EMU drivers of 1.5 version, this possibility is widely available last 1.5 years. Deeper information you can get on a site dedicated unofficial modified version of the drivers called APSLive. As for me, I'm not a great lover of Cubase. Besides, limitation in 32 MB for the total size of banks of samples doesn't suit me. But a direct support of the ASIO, richer possibilities of per-channel routing of effects, hardware compressor and equalizer may be worth it. In my opinion, it's not very important, though. The Live! possibilities are quite enough for organizing a small home computer studio. And availability of samples' banks in sf2 format on the Net and simplicity of the Vienna SoundFont Studio editor allows a musician at least to have something to start with. If you are interested in my own experience in usage of the Live!, well, here it is. I entered sampler technologies from the live music side. That's why I for a long time couldn't stand a poor timbre substitute, set in the keys and funny PC wavetable synthesizer with 1 MB of ROM which contained 128 instruments. With a widespread XG standard you can make different techno compositions for little money. But all live instruments (especially percussion instruments) sounded dimly and lifeless. And only on coming across the Live! 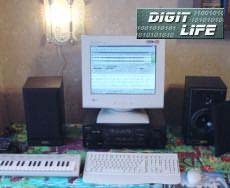 I changed my mind what concerns possibilities of modern musical technologies with their quite low price and wide availability (in 1998 the Live! cost $200, and now you can get the Value OEM (CT4830) at $45). And although the year 2000 was called a year of soft synthesizers, hardware solutions are still popular and can attain an outstanding success. But it's enough throwing word around. I rather turn to the subject under discussion and listen a composition written by me with only a "game and unimportant" sound card SoundBlaster Live! Well, here is my composition called August (4.86 MB, wma format 160 kbps). The music and arrangement are mine. The words are of unknown author. I once heard this song with a guitar playing. And now, 10 years after, I remade it. Some technical nitty-gritty details. I used 3 different samples' banks 42 MB in size totally (that's why to show you a wrk-file without sf2 banks is useless). The process of creation and recording of the composition was done in a sequencer CakeWalk 9.0 (that has a convenient SoundFont manager). The vocal was recorded quickly (i.e. without sampling of alphabet and working up a vocal party out of it) and without a claim for professional performance. :) Besides, I used a condencer microphone AKG C419 with its preamp AKG B29 (the guiding price is $150). But for your experiments you can also use a mic of the complete set of the Platinum 5.1. For compression and correction of AFC of the mic we used DirectX plugins from Waves: Q10 Paragraphic EQ and C1 Compressor. In the Cakewalk for it there is a possibility to make realtime references to any effects in any sequence on a chosen track in the column Effects. It should be only enough power of the CPU (with one audio track and two effects the CPU utilization was 10-15% on the P3-733). Echo and reverberation in the composition is made by a 32-bit processor of effects integrated in the EMU10K (with the APSLive drivers you can use also a hardware compressor with an equalizer from EMU, completely leaving the soft plugins). The sound card Creative SoundBlaster Live! Platinum 5.1 is in our opinion the best sound solution on the sound card multimedia market and can be recommended for very exacting customers.